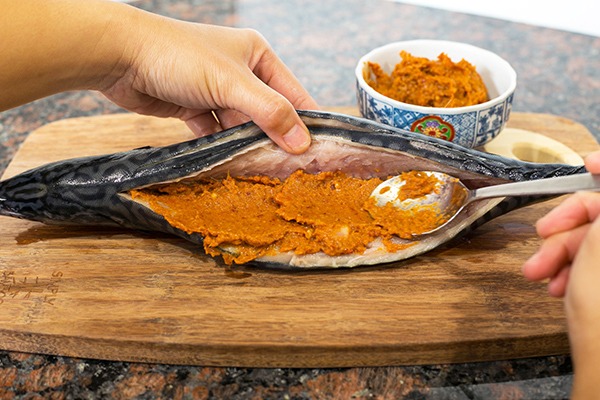 One of my favorite ways to enjoy fish while growing up in Georgetown on the tropical island of Penang in Malaysia was to have it grilled with some spicy sambal. The spice mixture is cooked first and then cooled before it is stuffed into side pockets cut into the fish. 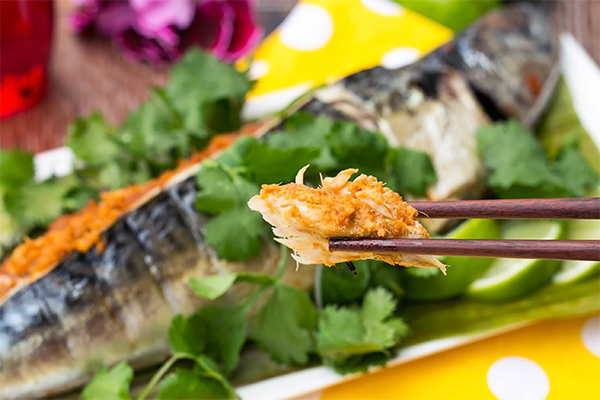 The fish of choice for this dish is fresh mackerel and luckily for me, frozen and thawed Norwegian mackerel is available in Asian grocery stores in Los Angeles. This dish has roots in Malay and Chinese cuisine called Nonya cooking which was created when Chinese immigrants settled in Malaysia and inter-married with local Malays. They developed a unique fusion cuisine which combined elements of Chinese cooking with spicy Malay cooking. This Nonya cuisine was further influenced by Thai cooking in northern part of Peninsular Malaysia and influenced by Indonesian cooking in the southern part. Of course, I'm not able to get all the authentic ingredients such as candle nuts, torch ginger buds, or fermented shrimp condiment to make this dish but I've substituted ingredients which are readily available in US such as lemongrass, tamarind pulp, and bottled sambal olek. 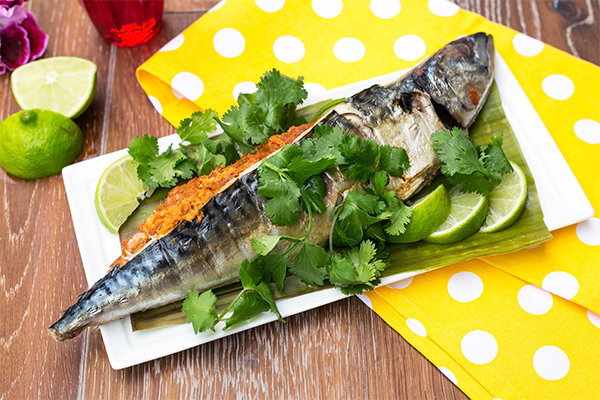 My US version of this Nonya recipe for grilled mackerel with spicy chili paste is aromatic, spicy, sweet, sour, and salty and will wake up your taste buds. It goes very well with steamed turmeric rice. If you ever visit Penang, this is a must try dish. 2 whole mackerel, cleaned and gutted. 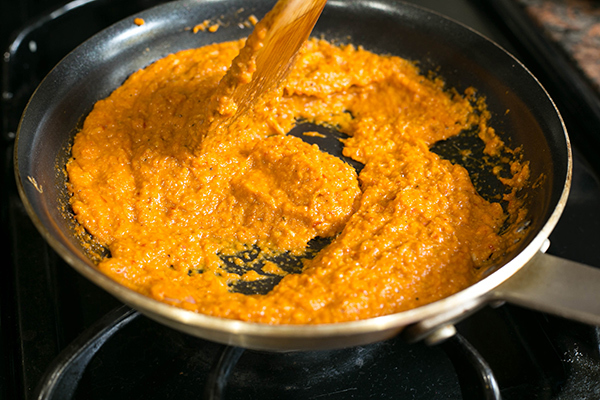 Cook the blended spice mix in a non-stick saucepan. After about 5-7 minutes or when the mix is cooked and you can smell the fragrance, remove and let cool. Clean the mackerel. 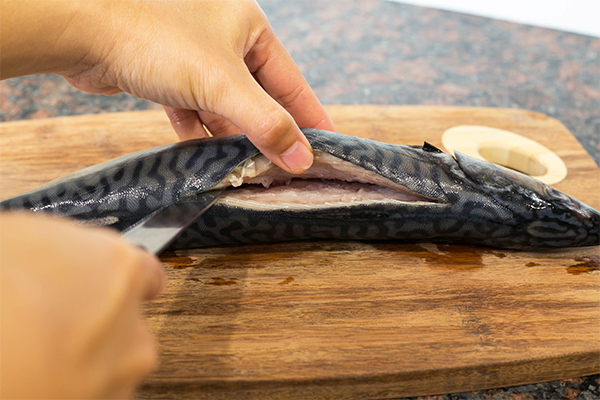 Place the whole mackerel on the side and carefully make a deep parallel cut following the length of the spine. You are making a stuffing pouch on each side on the fish, Repeat on the other side. Stuff the spice mixture into the left and right pockets. Setup a grill with a hot and cool zone. 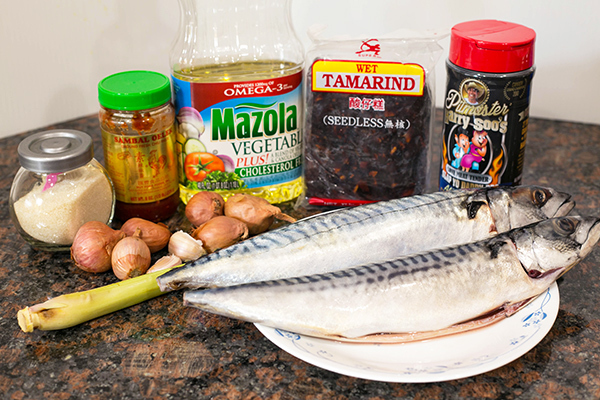 Drizzle oil all over the mackerel and place onto the hot zone. When there is some char and color, flip over and char the other side. Move to the cool side once the char has been established. 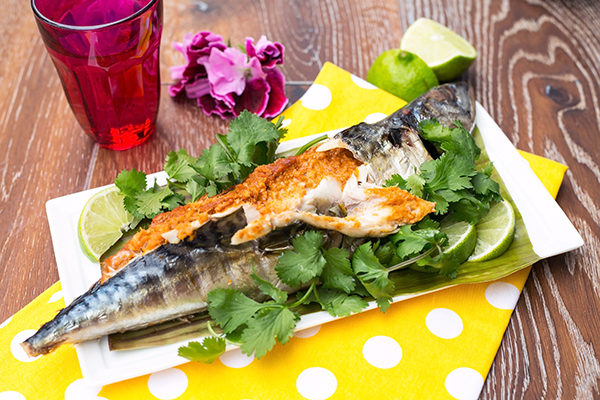 Be careful not to burn the mackerel. The oil that you drizzled will create a nice crispy char. That looks incredible. I always wondered what to do with this mackeral, or saba, as it is named in the japanese markets. Going to make a run now to pick one up. Wondering if I can use tamarind paste instead? Although, I’m a bbq aficionado, I find myself coming to this site frequently for the fusion dish recipes. Namely, Malay influenced foods that we have a hard time finding in Los Angeles. Keep the recipes coming! Oh boy, I’ll have one of each!